So basically no one applied to be rats editor this semester so I jumped ship on my previous section (RIP Style & Lifes) to come here. 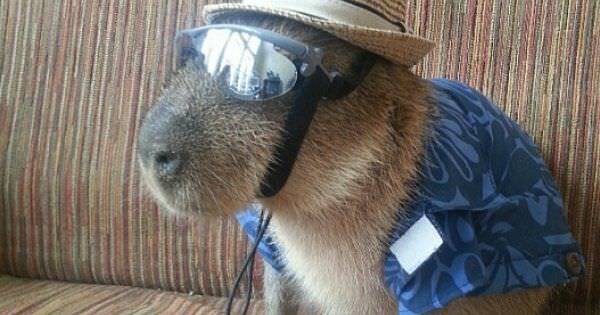 One downside to being the Rats editor is that I never get to talk about capybaras. This is a consistent pattern in my life since the first grade. Miss Miller wanted us to pick an animal from the rainforest to give a report on. Having snatched my brother’s quantum LEAPPAD learnin’ device, I learned about this real cool large rodent called the capybara. It def lived in rainforests. I was super excited to tell Miss Miller, but four days after my capy-confession, she revealed she did not have enough information available on the capybara for me to write about it. Yes, these were the primitive days when Ask.com was a seemingly better search engine than Google. Heartbroken, I had to write on tigers instead. I am sick and tired of the capybara being overlooked. They are rodents as well! Capybaras will not get confused for rats tho, since they are longer. To check, I went to Ask.com for more info. So literally the capybara can grow to be four-and-a-half feet long. That’s like a foot shorter than me. Rats could never. Capybaras split their time chillin’ on the land and kickin’ it in the sea. Take that surf and turf. Capybaras also kind of sound like “copy of bears.” I would like to prove this untrue. Capybaras are definitely still friendly rodents in the same family as Bugs and Mickey, not Yogi. It is wrong to presume anything else but this truth on capybaras. Capybaras mainly feast on grasses and aquatic plants. Yummy yummy, very Keto-friendly. Did you know it’s legal in the US to own a capybara as a pet? Yes that’s right, you can own your own capybara. They are very sweet animals, so they are a natural fit if you need an emotional support animal. Capybaras are not solitary animals, however, so make sure to buy two if you want to be a capybara owner. Wisconsin, luckily, is one of five states where dangerous exotic animal can be kept as pets even, so capybaras definitely are good here. I would love to see a capybara tap dance. That’s an opinion and not a fact, but I can include it since this is my report. I do doth protest being named Rats editor without acknowledge of the capybara, hence why I wrote this. OH? I’m “ARTS” editor? Ok. I said what I said.